If you have ever been to the HRDC office in Hardin, you have met Rose. Rose Iron as been working at the front desk in Hardin for two years, and has been the first source of program information for anyone who walks in. Rose’s knowledge of HRDC programs is more than just part of her job, it is part of her life. 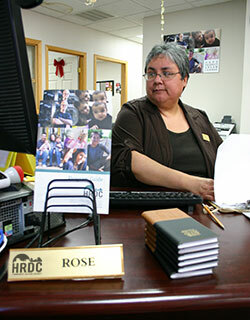 Like many employees of HRDC, Rose is a former client. “It actually all started several years ago when my son applied for and got accepted into the youth program.” says Rose. “I thought what a wonderful opportunity they are giving to the youth.” Since then, she has had another son go through the Youth program. She has also participated in the Food Distribution Program on Indian Reservations (FDPIR) and Section 8 Housing. Rose was asked to consider applying for the receptionist job by Barb Perzinski, Senior Program Director at HRDC. Her goal is to make everyone’s experience coming into the HRDC Hardin office as pleasant as the first time she came in as a client.